I've been using an AustriAlpin autolock carabiner with my Gri Gri 2 for around 9 months, a few times a week (1 to 3 times). 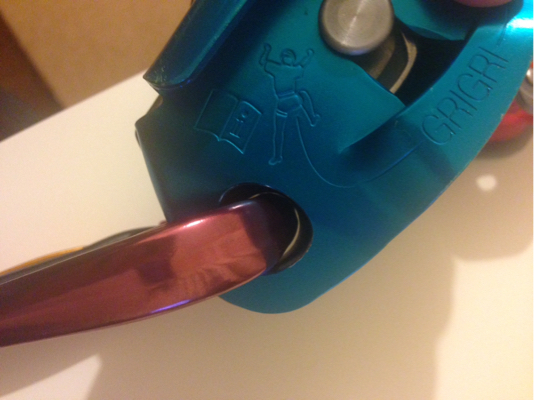 It's a very solid, robust and big carabiner, which means that's not too smooth in Gri Gri's hole, but IMHO, it's way far from being retired. 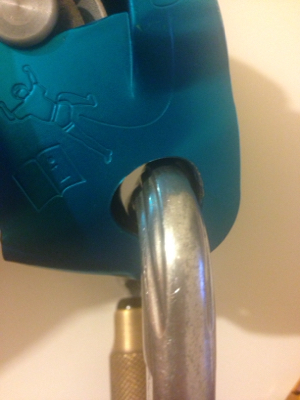 I had been told that if a carabiner is used with a Gri Gri, it should never ever be used with any other device. I do understand the concerns, but I've been googling this, and checking Petzl's site as well, but I don't see any evidence on that. 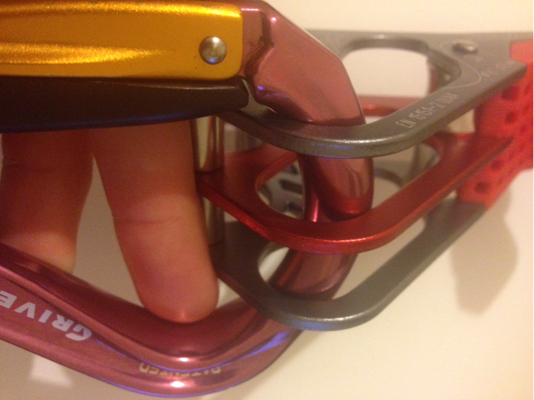 Grivel biner [despite being labeled as red] is pinkish purple with a gold gate, where Mammut Smart is gray and red. The color isn't matching and I'm a bit annoyed at this! It's somewhat curved on the wide end which means that Smart can't fully sit in it. I haven't tried them yet, but I feel like the Austriaplin biner fits Smart better, and then I won't have the color mismatching problem!! (though the set will be heavy again (I don't mind it for indoor use, but I still do like to use this Grivel!)). Any clues on this? 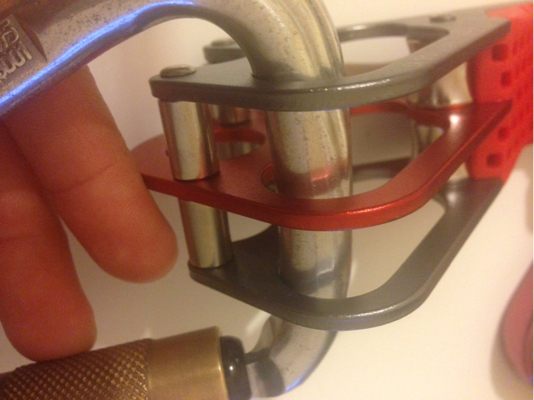 Shall any biner used with a special belay device, marry it and stay with it forever? The reasons for this recommendation are the same as with the recommendation to never use the rock side biner of a quickdraw with a rope. In both cases there is metal-metal contact. This leads to scratches and in the extreme case even well visible and sensible creases. In the latter case it is very clear that you should not use it in contact with ropes. Unless it is a rely big and sharp crease, you will never get it to cut a rope in two, but it will seriously damage it over time and you will ruin a good rope, that is much more expensive than a biner. If it is just light scratches (and they are always present), it is a matter of debate. As there is no rigorous testing done and published (at least none I am aware of), you can't give a definite recommendation either way. For occasional use I do not think twice about it. If a am mountaineering and the biner I grab first to do a Munter's belay is scratched, that really does not matter. 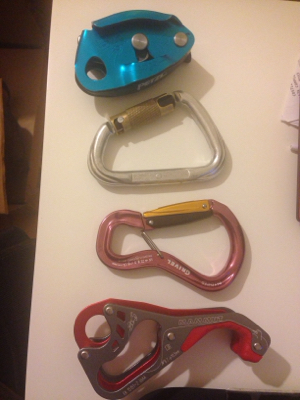 For regular use (sports climbing) I use unscratched biners, i.e. 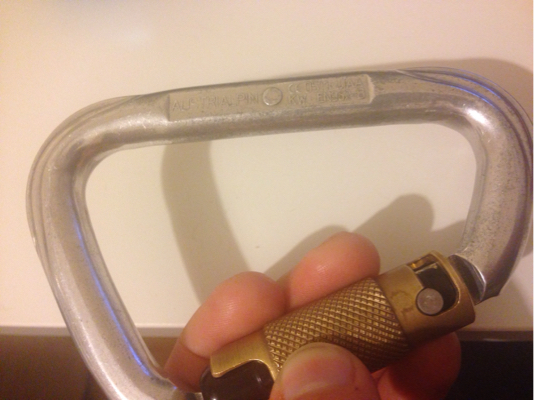 biners I do not use with a Grigri. In my case this is not an issue, I have much more biners than Grigris (1). Even if you don't, consider the price of a rope against the price of an additional biner, which you will need anyway if you will ever climb outside of a gym or a perfectly equipped climbing crag. As a big part of your reasoning is matching colors, so I dare say money is hardly the main concern. So just buy a matching biner for both devices. Like that you are both perfectly fashionable and safe. Not the answer you're looking for? Browse other questions tagged gear rock-climbing gear-care belaying carabiners or ask your own question. In rock-climbing, how do I safely belay another climber? Belaying directly off a ground anchor? Is there any evidence that attaching a biner to both seat and leg loops results in a 3-way load?